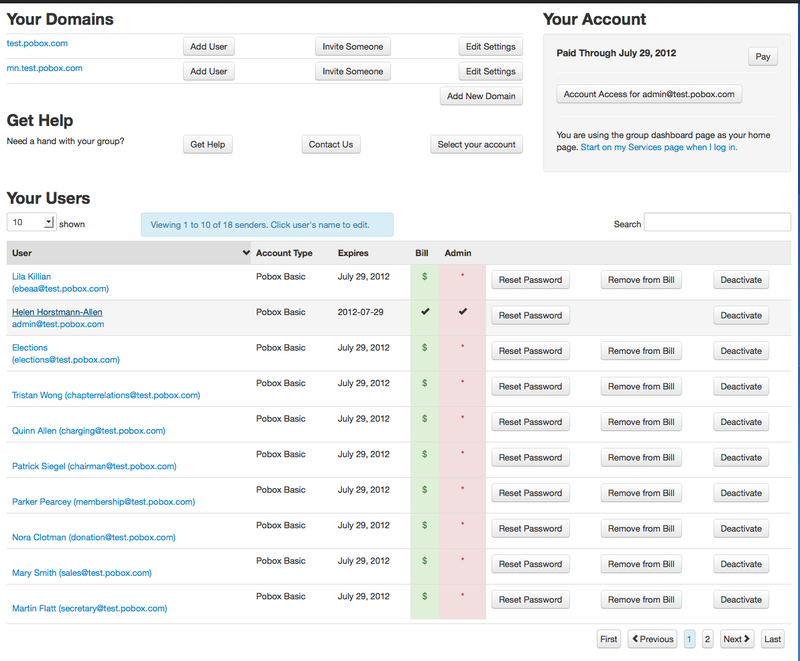 Personal domains are a much more common part of Pobox accounts, so they get their own spot on the Services page now. 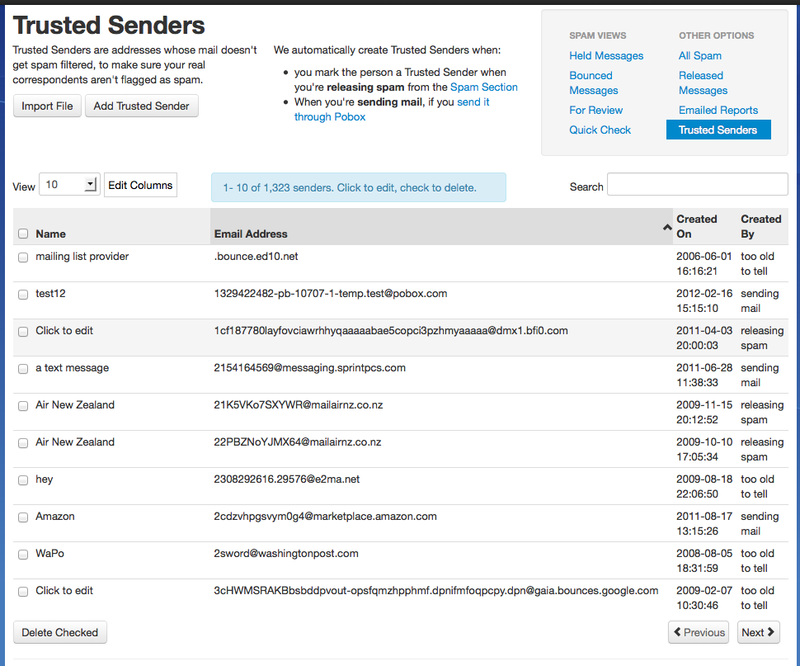 The spam slider has been moved off the Services page, and onto a page with the by-country blacklists. Most of you update your spam settings fairly infrequently, and we hope placing them with the country blacklists will encourage more of you to try them out! The new pages use a fluid grid layout, which means the pages adjust for comfortable viewing on many different monitor sizes. For those of you who use the website on your smart phone, tablet, or any other small screen, this should mean much less shrinking, growing and panning as you try to move around the site. Page sections should flow under each other to accommodate smaller sizes. To reduce scrolling on smaller screens, most instructional text has been moved to the right of the screen. So, if you need more context for a specific page, look for explanatory text under the form. In the same vein, the Spam section will now adjust the columns displayed with our best guess for what you need at the screen size you're using. You can always use the Edit Columns option to add back columns you wish to see and pan right, as necessary. 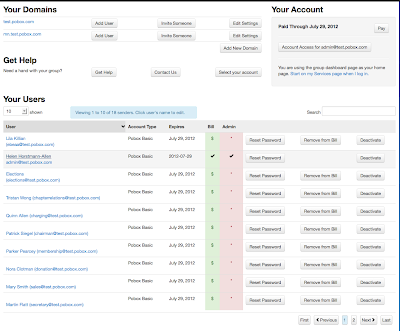 If you own or administer multiple accounts, you'll find our new Users tab very handy. When you're editing your own account, it shows Users, for a quick jump to the account dashboard. If you're editing another user, it shows you the name (or email address, if there's no name on the account) of the user you're editing. 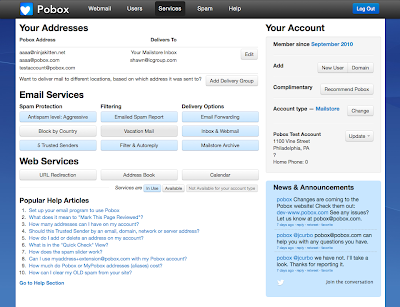 The Spam section has been adjusted to make page navigation easier. "Mark this Page Reviewed" has been renamed to the more straightforward "Release Checked + Delete Others" (of course, if the message was bounced, the sender will be mark trusted instead — there is nothing to release). That button has been moved under the checkboxes, making it easier to scroll down the page, then click the button as necessary. 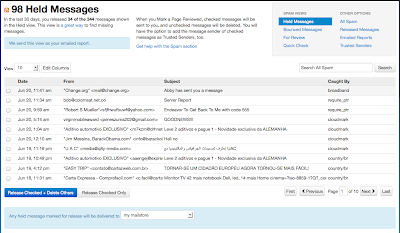 The "Release" link has been removed, and replaced with a second button, "Release Checked Only", so you can release multiple messages without deleting more easily.We've also added keyboard navigation — you can tab through the checkboxes, click return to submit the page, or keep tabbing over to the page number and use the right or up buttons to move to the next page. 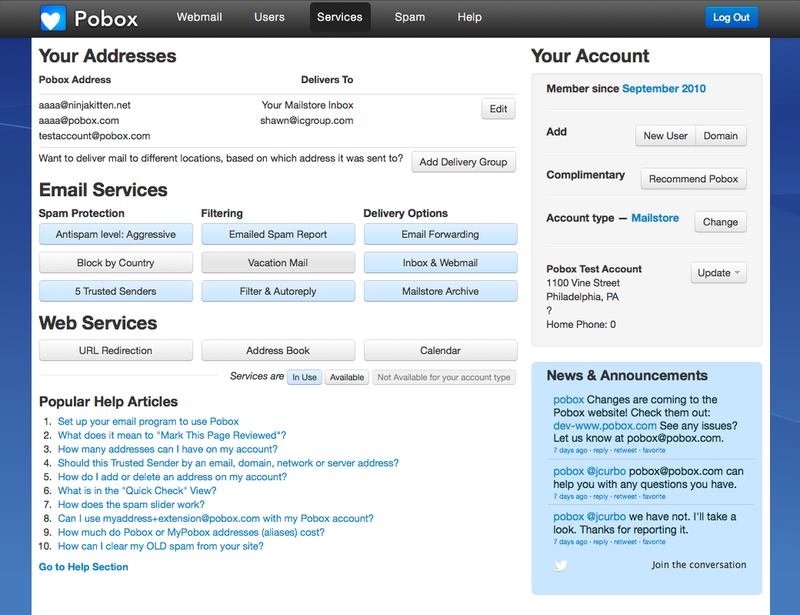 Each entry has a checkbox, which means you can mark multiple addresses for deleting at once. To edit an entry, just click the name or email address, and edit in place. 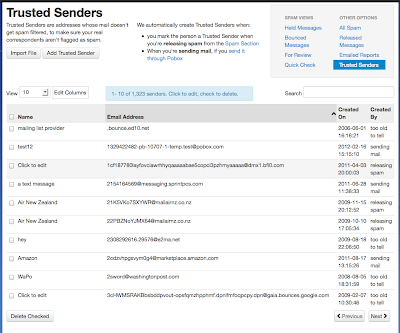 The table layout means you can sort the Trusted Sender table to view addresses that have been added recently, if you marked a sender trusted when releasing something that ended up being spam. 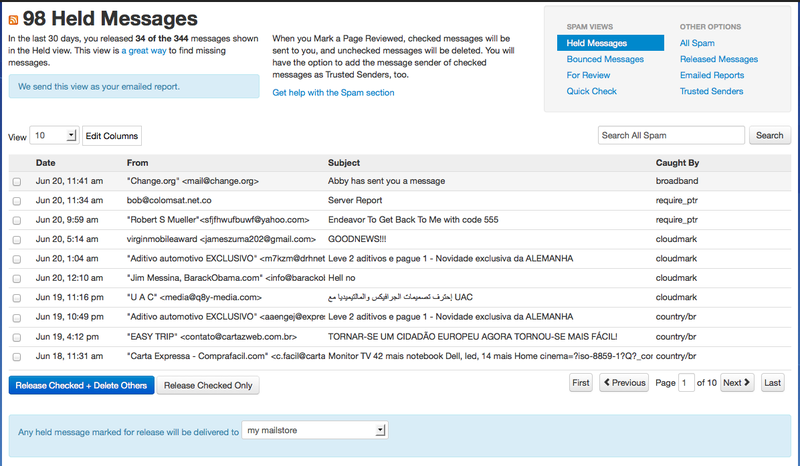 Overall, the changes should make it much faster to look at and edit your Trusted Senders. We've noticed that more and more of you recommend us to your friends on social media websites. (Thanks — it's really nice to see what it is you say about us!) So, we've added links for Facebook, Twitter and Google+ to the Refer A Friend page. They give a customized link that lets us know your friend heard about us from you. We hope you like the new changes. As with any site modification, there can be errors or interactions we just didn't see on our test computers. Again, if you notice an issue or see a problem, please let us know! Screen shots of what you're seeing are doubly appreciated.